The first time Mohinuddin and Aminuddin Dagar came to Europe for a concert tour in the mid-sixties, Dhrupad was perhaps at its lowest ebb in India. The appreciative response of western audiences was beyond expectation, and their performances in Venice, Berlin and Paris are still engraved in the memory of those present. The Dagar Brothers, as they are known, belonged to a prestigious family of Dhrupad singers whose founder was Baba Gopal Das, a Hindu who is said to have converted to Islam at the time of Emperor Muhammad Shah. His younger son Behram Khan established himself in Jaipur, where he became a court musician of great repute. He taught his brother's grandsons Allahbande and Zakhiruddin Khan who used to sing together, quickly asserting themselves as the foremost Dhrupad vocalists of their time. 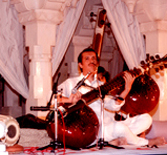 Zakhiruddin, an erudite musician, was offered the privileged rank of first court musician in Udaipur, whereas his brother was employed in the court at Alwar. A report from the first All India Music Conference held in Baroda in 1916 praises the two brothers' vocal duet. Musicologist Vishnu Narayan Bhatkhande was deeply impressed by Zakhiruddin's knowledge, as was the renowned Beenkar Bande Ali Khan, who gave the brothers his two daughters in marriage. One of the four sons of Allabande, Nasiruddin Khan was a highly sensitive and imaginative artist. His mastery of alap captivated audiences, but sadly he died in the prime of his career in Indore, and left a void in the field of Dhrupad. He in turn was survived by four sons , later known as the elder - Zia Mohinuddin and Aminuddin and the younger - Zahiruddin and Faiyazuddin Dagar brothers. Fahimuddin Dagar is the son of Rahimuddin Khan Dagar, a younger brother of Nasiruddin. Both were also well versed in the Sanskrit and Persian languages. Rahimuddin added the suffix Dagar to his name, and this new patronymic was then adopted by the whole family. Often compared to Nasiruddin for his musical sensitivity and spontaneity, Ziauddin Khan, the only son of Zakhiruddin succeeded his father in the Udaipur court. Although he would render Dhrupad singing in the way he was taught by his father, he also mastered the been, which he only played in private. Ziauddin transmitted his passion for the been to one of his sons, Zia Mohinuddin, who dedicated his whole life to preserving and promoting this awe inspiring instrument. Z.M. Dagar who passed away recently, was universally regarded as an exceptional musician. His command over the been was superb, and his senses of creativity lead him to express the alap in a unique manner. Endowed with a sharp pedagogical intuition, he and his younger brother, vocalist Zia Fariuddin, trained students in vocal music and various instruments, both in India and abroad.